The grandstand seats 10,000? Whoa, my guess for a small venue is way off! Have never been to Allentown Fair and was guessing it to be not much bigger than York Fair. Yup, was GREAT to be able to be at Red Rocks. It was all I had anticipated it would be and more. I will be there. Look for the big strapping fella with the tie-dyed Farewell short. I am sitting in the front row of section E.
I got that number off wikipedia, so hopefully its accurate. Really does look to small for that though. attending this show instead of Columbus. coming from Detroit. decided to come to this one because our close friends live in Carlisle. just need to find a cheap, clean hotel to stay at the night of the show. the ticket we got are section G row 4. off to the side a bit but still close! Some of you (including myself) have expressed interest in meeting up with fellow TFR members before/at the show. I think it might be a good idea, especially for those of us who have been reading/replying to each others posts and have never met. I have been looking at the fair map, and I think a good place to meet up before the show if anyone is interested might be the Bier Garten in the northeast corner of the fairgrounds. Opens at 5 (according to what i've read) on the 31st. Might be a good place to meet so those who drink could partake, and those who don't just don't. Appears to be an outdoor patio that allows drinking within the Bier Garten also. Its on the fairgrounds and dosen't look like a far walk to the venue. And there is a good chance that night that many of those there will be there to see RUSH. If anyone is interested in meeting up there, or has a better plan, send a post of pm. Can coordinate by phone day of show, or people who are interested could just wear, bring, carry something with TRF on it if they want to be identified. No matter what, hope you all enjoy the show! Anyone know the camera policy for this show? Living in the Phila burbs for so many years I'm finally getting to see a show at this venue. Weather looks A+ for anyone sitting on the track (21 rows) with out cover. I drove by the place on Saturday, wow, small! 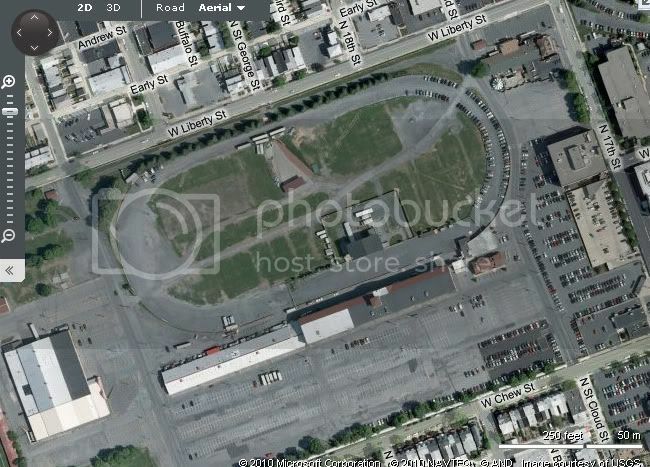 Its an old race track surrounded by row homes. The neighbors will hear a great show! I can see why they only have shows for 1 week because of its location. I'll be in row 3 of 27 in the grandstand. WOW! It does look small. Should be great seats anywhere. thanks for posting the pic. I'm even more excited seeing how small it is. Hope you have agreat time and enjoy the show! 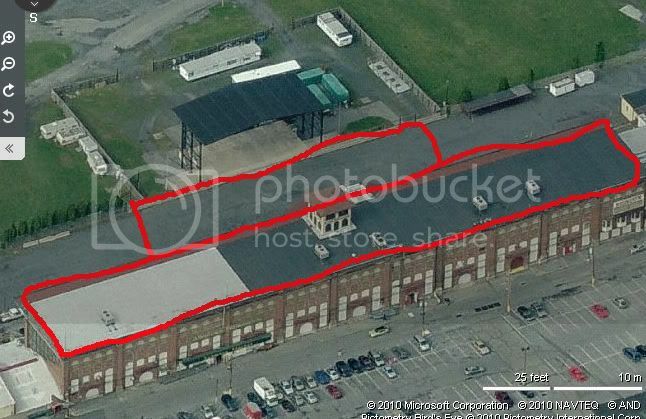 I live in Allentown and this will be my first show at the fairgrounds. I went on Friday and picked up a pair of grandstand seats. There were only a few seats left so the nice lady at the ticket booth wrote the seats down on some scrap paper and told me to go in and sit in the seats available and tell which ones I wanted. Where does that happen? I went in and sat in a few seats. All I could think was "Rush is playing here?" LOL. I'd love to hear the conversation on the bus when the boys pull in and see where they'll be playing. I don't think there will be a bad seat in the house. 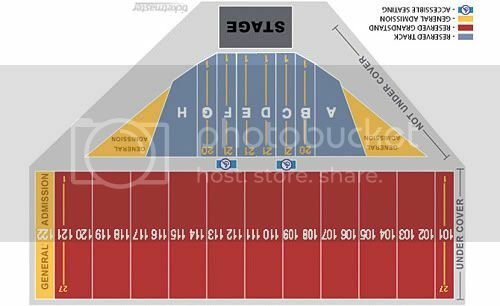 I'll be in section 112 row 6. might see some of you guys there? Going to be rediculously hot (just like Camden), but no rain. I'll be there, Section B row 2. Can't wait. Hope to see some of you TRF members there. Probably stop the Bier Garten (at the fair and short distance from the venue) if I get there early enough. Gonna wear or carry something with "TRF" on it in case anyone wants to meet up. Hope everyone enjoys the show! I get that. To be fair, I spent many, many shows watching them from the rafters. Hope you're right. Looks like I'm way the hell off on the left side of the grandstand. Kind of an extreme angle. Hopefully the view will at least be unobstructed since the track seats are uncovered. Damn ... feeling like I should have just resolved to go by myself early and grabbed a great seat. Will look for you. I will be wearing a tie-dyed shirt with the Farewell skull and crown on it. I'll be at the Brew works at 2pm if anyones interested. Will get to the Biergarden at the fair by 5 for a few before the show. I be in a black R30 shirt with equations on the front. Hope to meet some of you before the show!! Should be an awesome show tonight for all. Will definitely look for those who provided descriptions. Trying to get to the Bier Garten by 5 or 6. I'll probably be wearing a plain colored t (possibly the shirt from the premium package) but will definitely try to have some TRF indicator (giant Neon sign flashing...or mabye just a post-it note). For those of you who arent pumped yet...get started...almost time...even the tumble weed from earlier posts should be excited by now. theres 5 people in here now. I think thats the most since the hot tub started. BTW at work now and don't really care. Almost time to hit the road. Going to see this band tonight at the Allentown Fair. Small place so probably just a bunch of nobodys, but you never know what you'll find at a fair. What are you guys up to tonight? Should come to the Fair and check out this band. I heard they might be kinda good.